A home to call your own – is the dream which many lives. 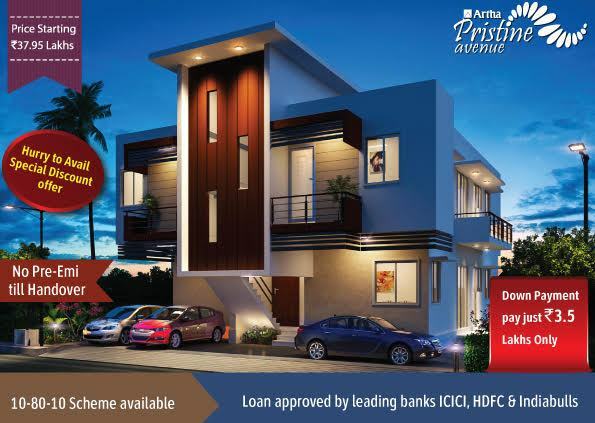 To realize the same, Artha presents Pristine Avenue – meticulously crafted villaments for all those who feel reflecting the status comes only with a heavy price. We have turned the table around & made sure that millions of people own what they desire the most – A home to call your own. 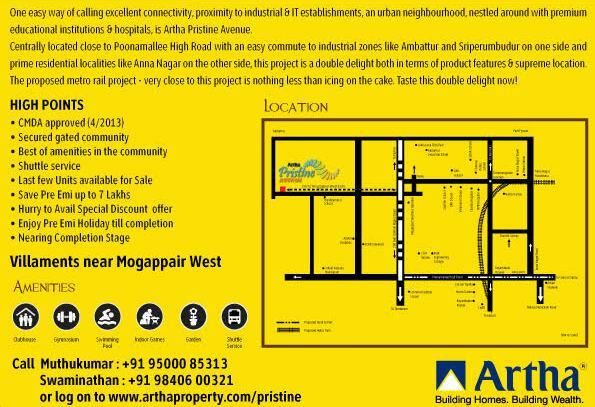 Pristine Avenue is an impressive articulation of contemporary ideas blended supremely with essential civic infrastructure and social amenities. With 60 elegant villaments for all those who aspire to own an urban living; this self-sustaining habitat offers an opulent chance to live a life where you can share all little memories with your loved ones. Last few units available for sale . we are glad to offer a limited period Special discount offer with No Pre-Emi Till handover or Assured Guaranteed Rental scheme for 3 years up to Rs.20000 Per month - to Corporate client on the above said price starting from 29th June 2016. The scheme period will automatically end on the 31st July 2016 and you can confirm your booking of the dream Villament by paying sum of Rs. 100000 as booking advance. Refer friends Earn big get Rewards 1% Pay Out bonus on sale Value . Kindly rush to book your dream Villament at the special price. For Site visit and booking Please call 95000 85313 .